1) Due to privacy concerns, the student's full name and personal details (such as Identification no) will not be revealed. 2) We faced difficulties in getting the report books of Primary School students as the report book was usually returned to the teacher before the holidays, unlike the secondary school students who get to keep them over the period of holidays. Hence, most of the results in this page will consist of secondary school students. 3) We DO NOT take credit for improvement in subjects that the child do not have tuition with us. Xiao Tong (S2) came to us after scoring F9 for Mathematics. Look at her jump in grades! from F9 to A2! Ning Xuan was struggling with science concepts. She could not answer the questions using the right key terms and words. After a few months of tuition with EduFirst, she somehow managed to grasp the concepts better and... shown a great improvement in her SA2 results! Daniel recently came to Singapore for his studies. He was struggling with English as it was his weakest subject. When he first joined us, he was scoring only C6. At the SA2 exams, he scored A2! Congratulations to Travis Ang (P4) and Tricia Ang (S1) who have received the Edusave Awards. Both of them have been with EduFirst for the last 4 years. Nureen was an average student scoring 3's and 4's. Over time, she has been making slow and steady improvements to get to where she is today. She scored a grade 1 for her POA at her N level examinations! Alister came to EduFirst at the point in time where he hasnt been able to pass his POA examinations at all. We are very happy he achieved a grade 2 at his N level examinations. This is such a far cry from the days when he was failing! Shifa, who came to us with F9 for her mathematics in SA1, attended tuition with EduFirst and finally pass her mathematics with a C5! Her mom was so happy with her results! We are so happy to know that she has scored A's for both Pure Physics and Pure Chemistry for her 2015 O level examinations. 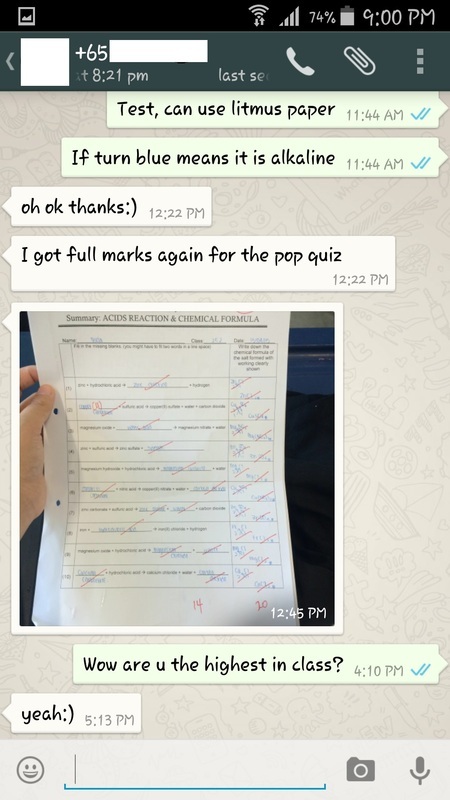 This is such a far cry from her results in sec 3 and sec 4. Hwee Yee has been with us since she was primary one. She has been taking Math tuition and eventually added on Science tuition with us when she is in Primary 3. We are very happy with her progress in both the subjects that she takes on tuition with us. Jan Ning (S4E), joined us at the end of Secondary 3 when she did poorly for Chemistry. After 9 months of tuition with us, she has seen a great improvement in her results. 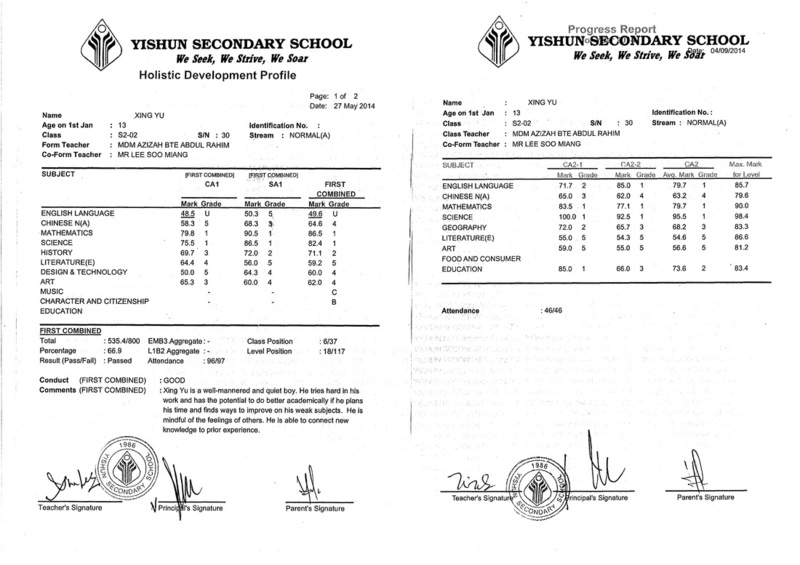 She scored A1 in her latest Preliminary examinations in the top school in Yishun (Yishun Town Secondary). 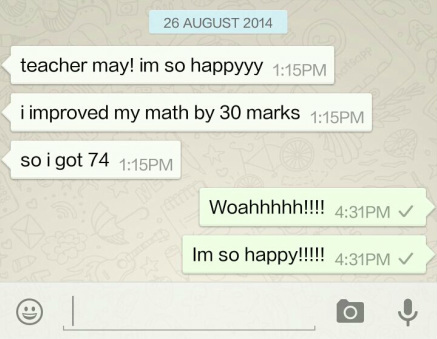 Congratulations to Dai Ying (S4NA) for her fantastic 'N' Level results! She scored 6 points for her EMB3. Daiying has taken Chinese, POA, Math, English and Chemistry tuition with us in the last 2 years. She made it to PFP (currently in a Polytechnic) and is still having tuition with us for English and Mathematics. Jia Rong (S3E), has been with us since Secondary 1. He was in NA stream at Sec 1. Coupled with our help and his hardwork, he managed to be promoted to Sec 2 express. Now, at Sec 3 , he is taking Triple Science and double Maths! 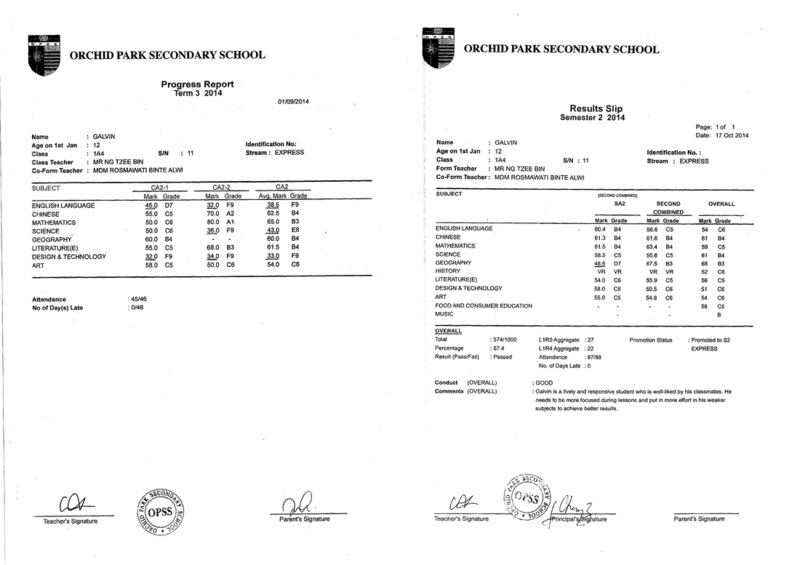 In his latest common test results, he achieved distinctions for both Maths subjects that he takes tuition with us. Continue to keep up the good work, Jia Rong! 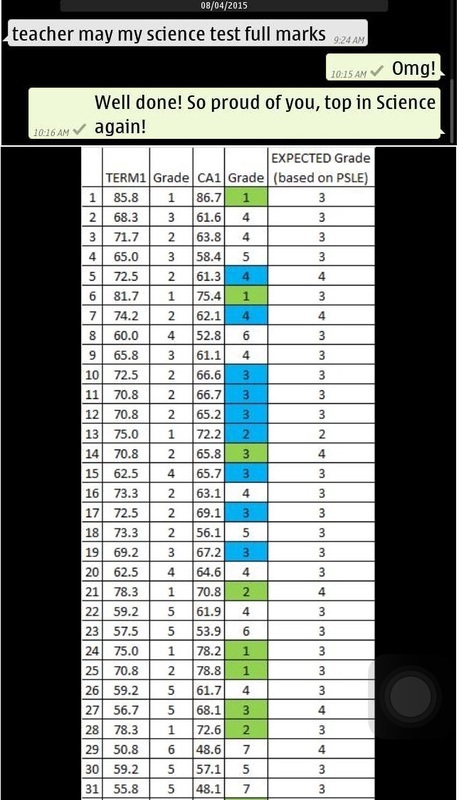 Tricia Ang (S2E), has scored the highest in class for Science in Term 1! She is index number 1 (as seen in the picture), and that she has performed beyond expectations based on her PSLE grades. We are so happy for Tricia! Keep up the good work and continue to excel! Valda (S1E) has been achieving borderline passes in Chinese for her CA1 and SA1. Valda's father then decided to enrol her for our Chinese class. Her Chinese grades went up from C6 to A1! 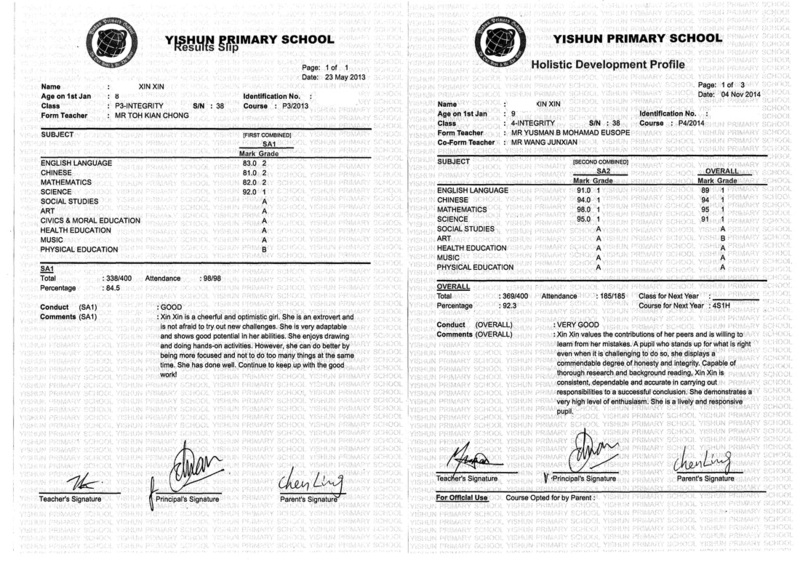 Xin Xin (P4) has achieved FOUR Band 1's for her Final year Examination results! Previously, she used to get Three Band Two's. What a great improvement! Well done Xin Xin! 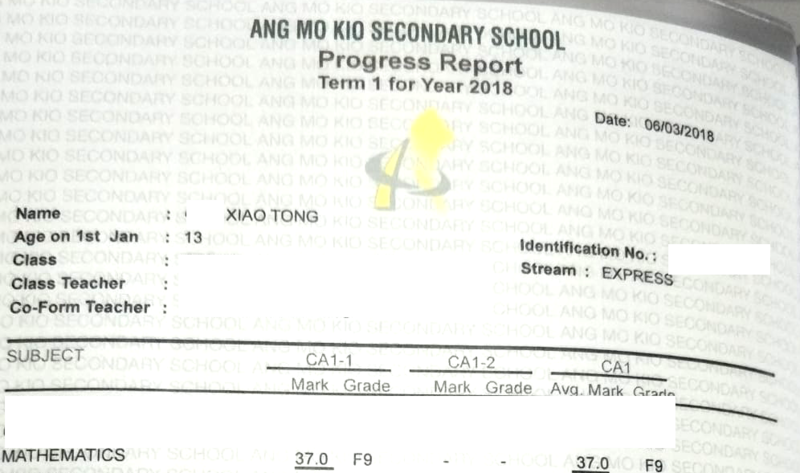 Our student, Dai Ying (S4), who was usually scoring B's for her Chinese, scored A1 in this year's June O'level examination. Fang Kun takes English tuition with us (scroll down to view his case study). Seeing the great improvement in his results, his dad decide to enrol him for Science. Fang kun did so well in his Science that his father called to personally thank Fangkun's tutor for her effort! His father said that it was beyond his expectation that Fang Kun could manage to improve so much and score so well in Science! We are so proud of him. Well done! Xing Yu joined us with a U grade in English in his CA1. Jolo's mom enrolled Jolo for English tuition with EduFirst after Jolo failed his CA1 test. He got a U grade. Ever since, his grades have been climbing steadily. From fail, to a C5, he eventually scored a B4 during his CA2 and... A2 in his final year examinations! Tricia (S1E), has been with us since she was in Primary 4. She is doing Science tuition with us. Her science results has been consistent and maintaining at around A1 standard. Tessa joined EduFirst about 3 months before her SA2 examinations. She scored F9 for her SA1 Mathematics examination and her mother was extremely worried. On the first lesson, Tessa's tutor diagnosed her weak areas and from there on, customised and tailored the lessons to suit her learning needs. The framework used by her tutor proved to be extremely effective as Tessa scored a B3 (a huge jump from the previous F9) in her final examinations! Galvin's mother came to us, hoping to get a 'miracle' for his son. His son has been failing English and the school told her that his son may be RETAINED. With only 3 more weeks to the SA2 examination, Galvin's mother pleaded with us to arrange for intensive classes to give him a final push. The tutor at EduFirst really tried her best and helped Galvin. Galvin scored a B4 for his SA2 examinations and is successfully promoted to Sec 2 Express. We are so happy for Galvin! Frankly, given the short period of time and the amount of improvement needed, it was quite an uphill task to bring up his grades. Yun Sheng joined us for science tuition about 2 months before his exam. 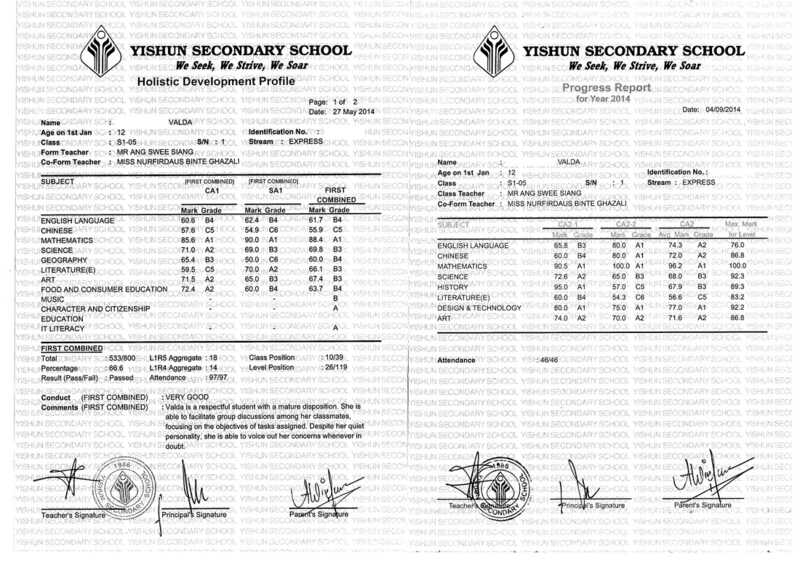 His science improved from E8 to B4 in just a short span of 2 months! 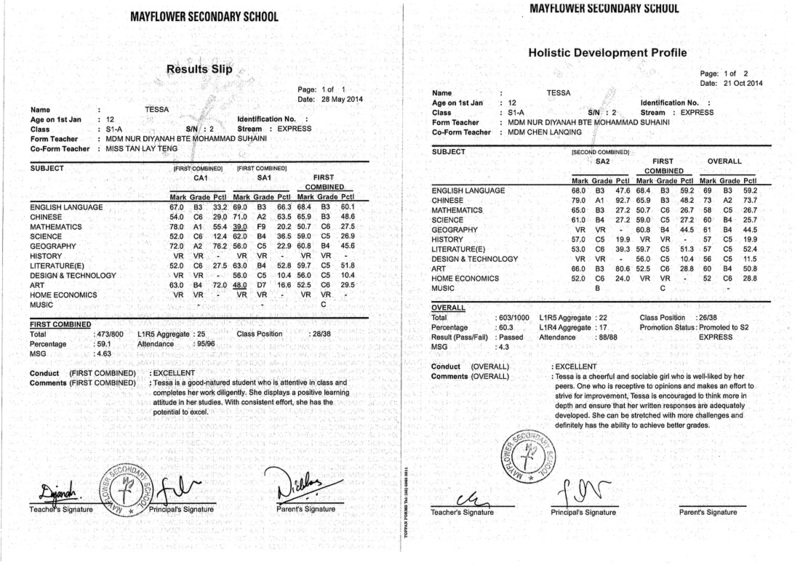 Jamie joined EduFirst with a score of 59/100 for her SA1 Mathematics examinations. After attending tuition with us for only two months, she scored 93/100 for her SA2 examinations. This is remarkable! From a C5 to a very high A1, we are so proud of Jamie! Chemistry D7 --> A1, Well done! Olivia joined EduFirst for Chemistry tuition after failing her SA1 chemistry Examination. After which, she has been topping the class with A1's in her common tests! Her friend, Eunice, who joined the tuition together with her, has also shown remarkable improvement in her Chemistry results. Eunice joined EduFirst for Chemistry tuition together with her friend, Olivia. Eunice had scored a F9 in her SA1 examinations. She had no idea what was going on in Chemistry. By CA2, she started to pass and eventually scored an A2 for her Term 4! Congratulations to Alvis Tan! He did us proud and scored a Distinction in the Maths Olympiad Competition 2014 (Primary Mathematics World Contest)! Our Primary 6 student, Putri, who was so excited to have improved 30 marks and achieved 74/100 in her Preliminary Examinations. Josiah has never passed his Mathematics after Secondary 1. 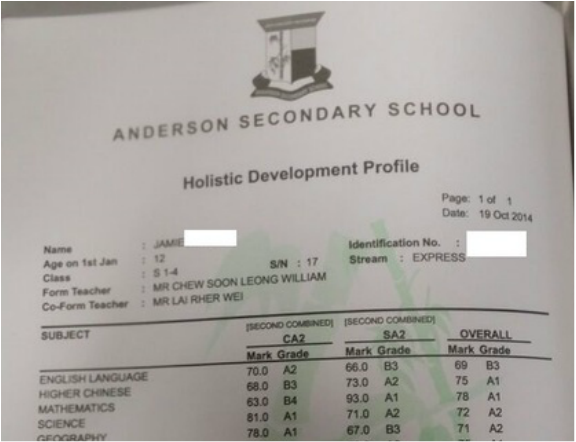 At the end of Sec 2, he had only scored 25/100 for Mathematics. His Mathematics foundation and conceptual understanding was so weak that it would be an uphill task for him to handle the demands of the upper secondary Mathematics. On the recommendation of his friends, this student decided to join EduFirst at the end of Secondary 2. Slowly, he was improving. He then started to pass Mathematics (Finally!) and was already very contented with his progress. It was a far cry from the rock bottom grades he used to obtain. He was ecstatic when he achieved 64/100 for his Mathematics in the latest examination. It is a good improvement of over 40 marks from his lowest grade! Upon seeing the great improvement, his mother decided to enrol him for EduFirst's English tuition and Chemistry tuition as well. The tutor is working very hard with the student to aim for an 'A' grade for Mathematics in his 'N' Level examination. Chloe was extremely weak in Chinese. 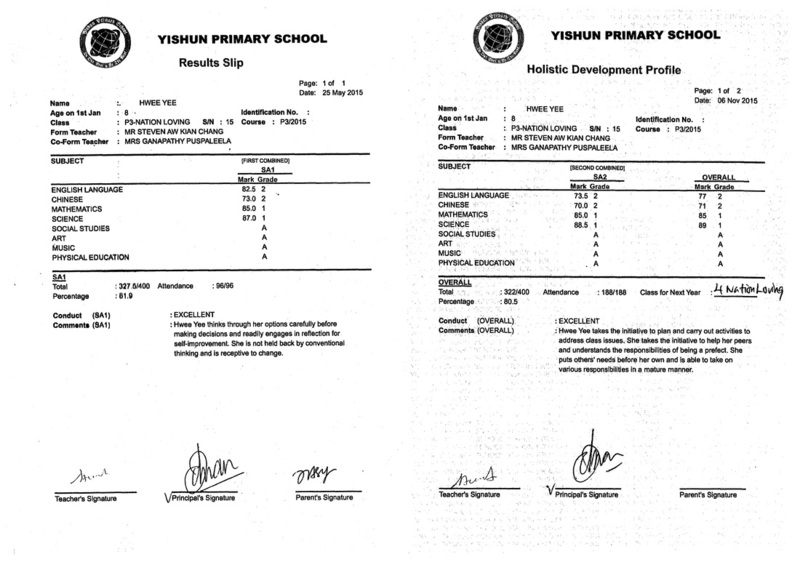 At primary 2, she failed Chinese, scoring only 47.5/100 in her SA1. She joined EduFirst in July'10. 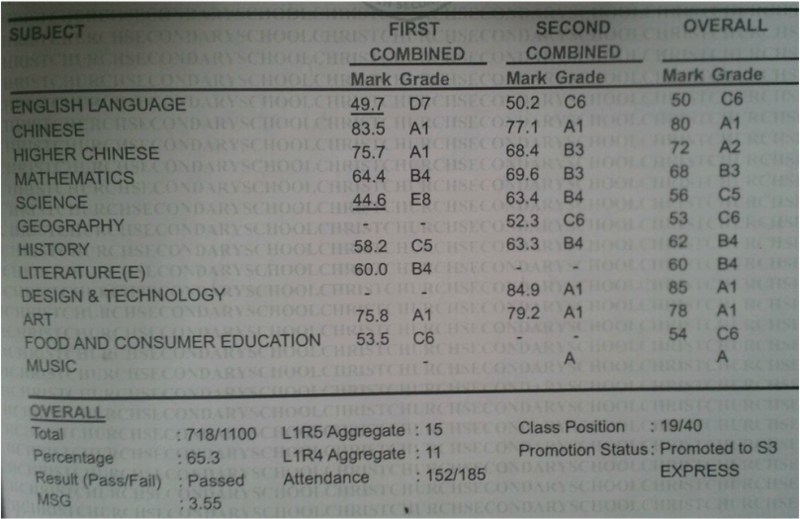 After our tutor's guidance, we are very happy that she scored 64.5 in her SA2 results. 47.5 (Fail) --> 64.5, Well done! 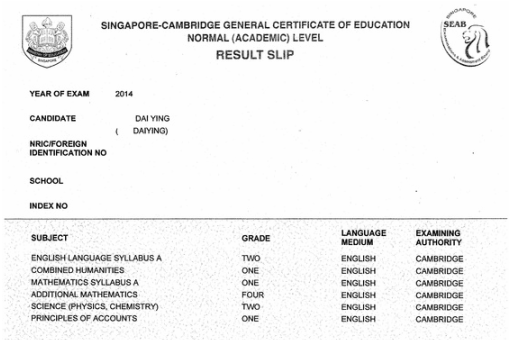 Daiying had done badly for her Mathematics in CA1, scoring only a B4. She came to EduFirst, hoping to get some help to improve on her Mathematics. The small group tuition at EduFirst proved to be helpful for student. She received good guidance from her tutor and was able to work on her areas of weakness. By the end of the year, she had managed to achieve A1 for her Mathematics in her SA2 exam! B4 --> A1, Well done! Deepa had been failing English since Secondary 1. She began to panic when she was still failing at Secondary 3 (with her 'N' Levels drawing closer). She finally decided to seek help. She did not have much expectations of herself. She only wanted to PASS English since it is COMPULSORY for English to be calculated into the EMB3 score needed to proceed from 4N to 5N or to direct admission to the Polytechnic Foundation Programme (PFP). At EduFirst, her tutor worked on her area of weakness. She was taught skills and techniques on how to tackle comprehension questions. Her tutor had also worked on her essay writing skills. In the end, she had gotten more than she asked for! 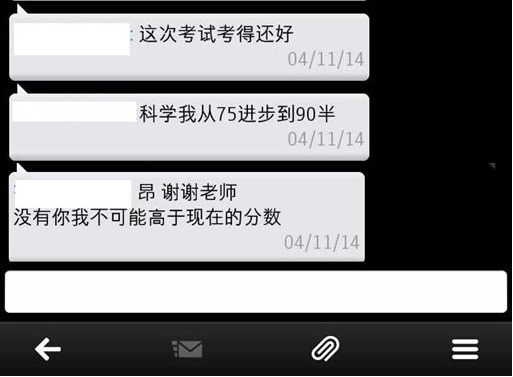 In the quick span of 4 months of tuition, she managed to achieve close to 60/100 for her English. 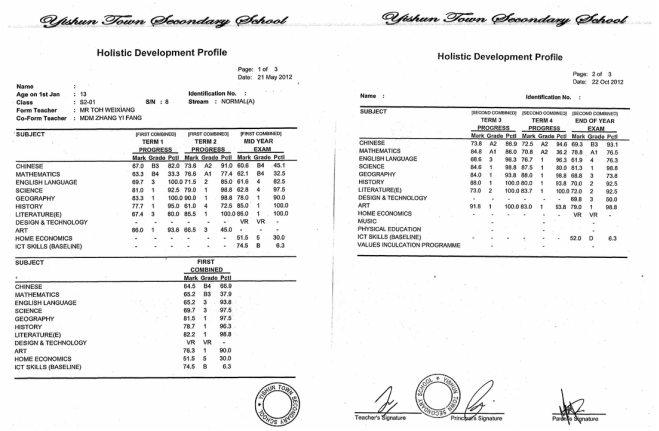 At Sec 1, Kleeve was scoring C's and occasional B's in his Mathematics. By early Sec 2, after his CA1, his mom was sensing the urgency to seek help because Mathematics is an important subject for the streaming year. It bothered her very much that her son was a laid-back student who only played games at home all day. Kleeve then joined EduFirst for Mathematics tuition. Of course, it was not an easy task especially when the student is not motivated on his own. The tutor at EduFirst focused very much on working student's foundations so that he could have good conceptual understanding of the topic. Thereafter, the tutor also drilled him on the exam-style questions to help prepare him for his examinations. Academics aside, the tutor had also given him a lot of encouragement, showered him with praises generously and constantly motivated him to study hard. Student eventually managed to score a whopping 81/100 for Mathematics by SA1! Just in the span of 2 months! Loga was achieving borderline passes for English and failing Science for first half of the year. When she joined EduFirst, the tutor worked on her English grammar and vocabulary intensively because she was clearly weak in that aspect and lost many marks in that component. She was also lacking in composition writing skills. Her storyline was in an illogical sequence, incoherent and had a lack of climax. The tutor was very patient with the student and targeted on her weaknesses. By the end of the year, student saw a huge jump in her English and Science. Her mother was so happy and gave the tutor many boxes of festive cookies! Tutor is very confident that her progress will only be heading one way - upwards. She will only get better. English 50 (Just pass) --> 64.5, Well done! 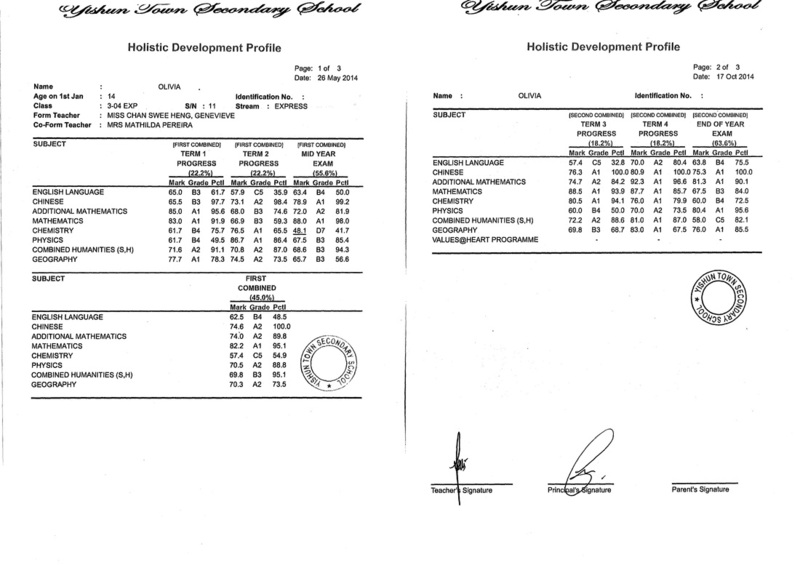 Science 33.9( Fail) --> 51.5 (Pass! ), Well done! English 49 (D) ---> 59.5, Well done! Science 37.5 (Fail) --> 57.4, Well done! Thurga failed her English and Science badly during her SA1. Student is a very keen learner. However, she needs very close guidance and much more time to understand concepts. In a bid to help her to improve, her tutor dedicated extra time and effort to teach her by giving her extra lessons to boost her grades. Thankfully, both their efforts paid off. 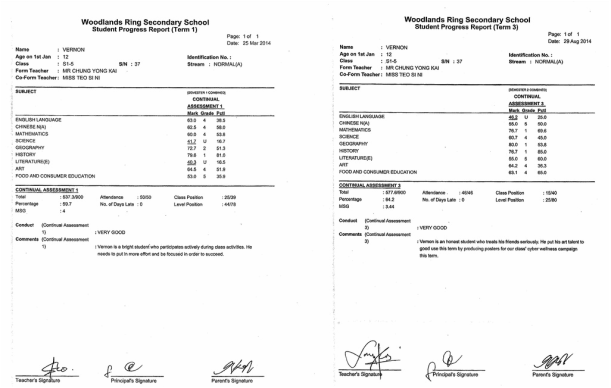 Student saw a great improvement in her results! Her mother was so pleased with the improvement! Nicole first enrolled in Mathematics and Science tuition with EduFirst after the release of her SA1 results. Her mother was very concerned with her results as she would be sitting for PSLE the following year. She failed Science and was managing 60's for her Mathematics. After assessing the student's weaknesses, the tutor decided that the best approach is to work on her Science is to expose her to exam-style questions and to teach her how to answer open-ended questions using the right key words and the right techniques. As for Mathematics, the tutor taught her heuristics and drilled her on problem sums since her conceptual understanding was good. 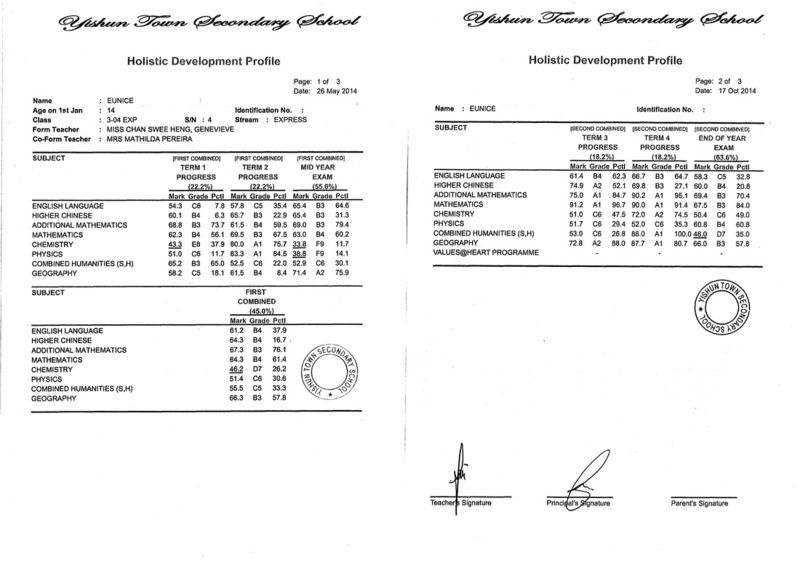 In a short span of 4 months, She managed to improve by leaps and bounds, and did well for her SA2 exams. 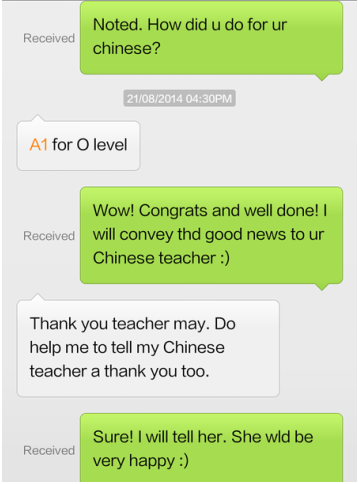 Pleased with her great improvement, her mother decide to enrol her for Chinese tuition classes as well. Maths 66 (B) ---> 80(A) , Well done! Science 43,2 (Fail) --> 77.5 (A), WELL DONE! Mabel joined EduFirst due to the poor grades she obtained in her SA1 Mathematics examination. The small group size proved to be effective for the student. The tutor went through her corrections individually with her, and drilled her on exam-style questions using EduFirst's materials. In a short span of 4 months, she showed an improvement with a jump in a grade. Mathematics 66 (3) --> 76 (2), Well done! Andre enrolled in the Mathematics and Science tuition. It was his streaming year and he failed those 2 important subjects at SA1. He is a very quiet and shy boy, so his mother wanted a comfortable learning environment for his son. In a small group setting, it was very easy for the student to raise questions to ask the tutor. He enjoyed the small group interaction and liked the learning environment EduFirst offered. Andre was a keen learner as well. Coupled with the help of his tutor, he made good progress by SA2. We are glad to have salvaged his grades and helped him to get a desirable subject-combination of his choice at Secondary 3. Mathematics 36.7/100 (U) ---> 63 (B4), Well done! Science 49/100 (U) --> 67 (B3), Well done! Mohashini student joined us when she obtained a F9 for her Mathematics in her CA1. She was utterly confused with the positive/negative integers, as well as Algebra. The effect snowballed, and she soon lost interest in Mathematics. Her tutor motivated her to try hard. Student was, in fact, a fast learner. With very close guidance, by SA1 she scored 64.7. Mathematics 35/100(F9) --> 64.7 (B4), Well done! Fang Kun is from China. He has no knowledge and background of English when he came to Singapore. His dad came to EduFirst and requested to have a tutor who is effectively bilingual in both English and Chinese, so as to guide his child in learning the English Language. After a semester of intensive lessons, he improved by leaps and bounds. From not knowing the language at all, to scoring 62 in the SA1. He eventually scored 77.5 in his SA2. His father was so pleased with the results and came down personally to the centre to thank the tutor. English - Not knowing the language --> 77.5 (SA2), Well done! 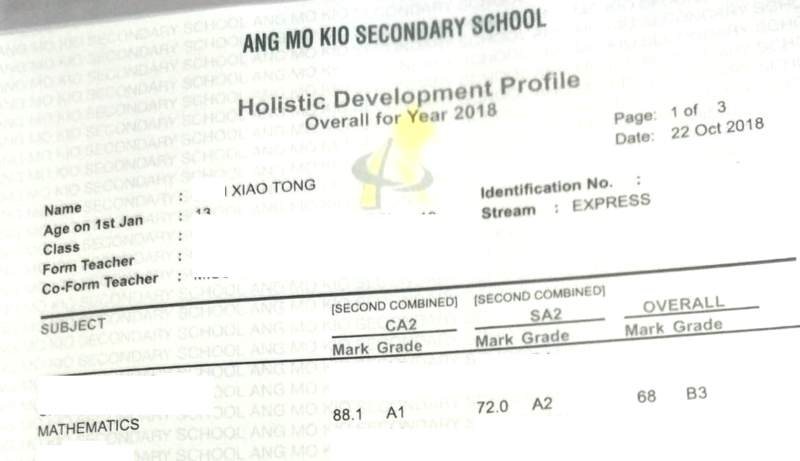 Pow Jia Rong (S1-S2) from Normal (Academic) stream and advanced to Express Stream, due to good improvement in his English and Mathematics. Brayan Liow (S1-S2) awarded Edusave Scholarship for being the 10% of his cohort. He took 4 subjects (Eng, Chi, Math & Sci) with us. Phua Qian Hua (S4E), joined EduFirst with a C6 in Chemistry and eventually achieved an A2 at her O'levels. Weng Xin Xin (P1-P4), consistently maintained Top 3 positions in her class over the years. She takes 4 subjects with us. 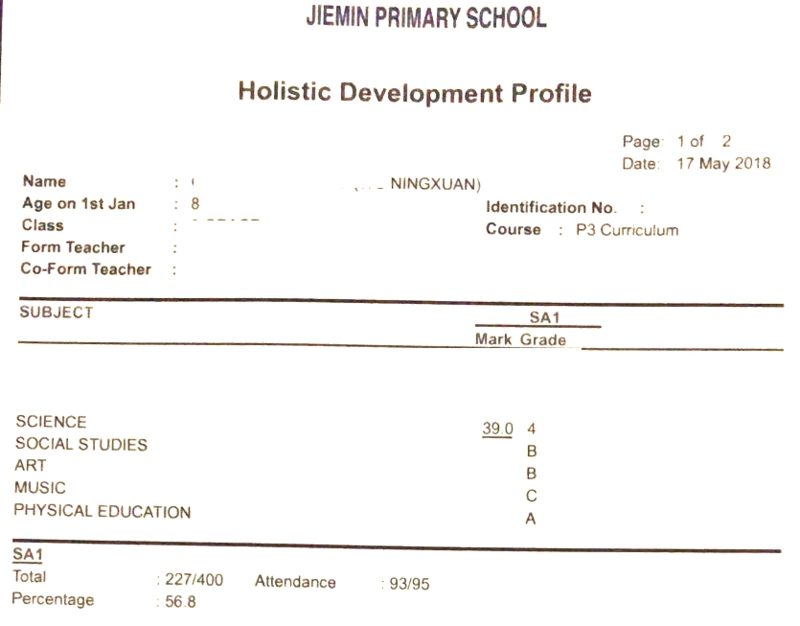 Tan Jing Yi (P1 - P2), consistently maintained Top 3 Position in her class. 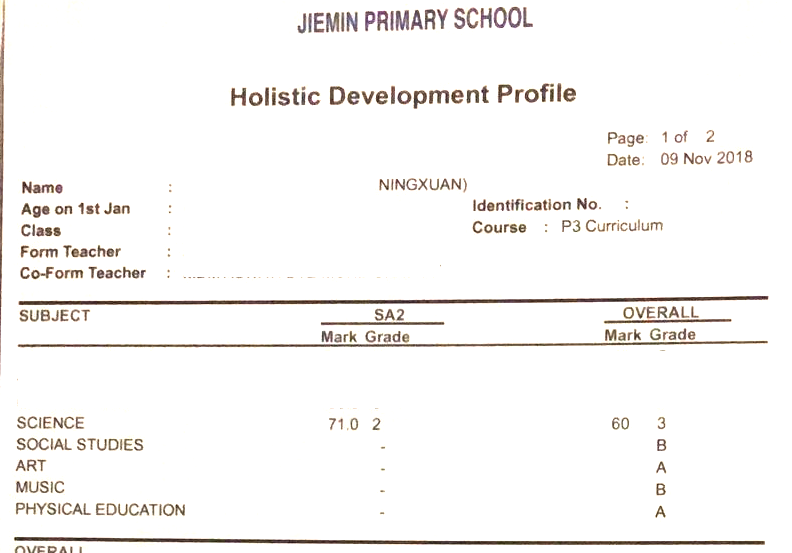 Lim Wei Jie (P6), progressed from B in Science during school prelims to an A* in PSLE. He took Science tuition with us. Wynne Sim (P6-S2), top 5 scorers in her school for PSLE having achieved an aggregate score of 261/300. She is currently in NJC (IP). She took Maths & Science tuition with us. 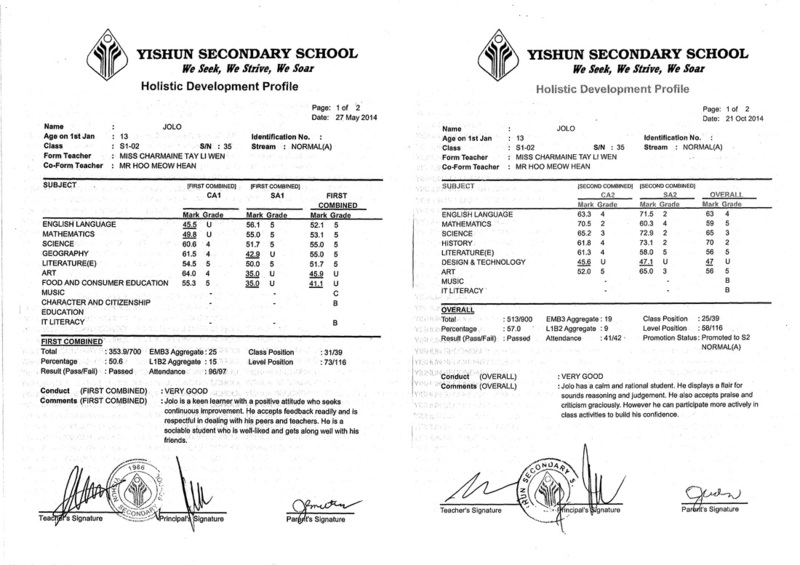 Tan Hui Wen (S4), achieved distinction A2 in Elementary Mathematics after having E maths tuition with us. Christopher Choong (S4), he was forced to drop A maths because he used to fail so badly (F9). He achieved a B3 in O'levels and is currently studying in a JC. Yogi (P6), has been failing English and managing borderline passes for Maths. He finally passed his English in the latest SA1 examination and scored 85/100 (the highest in class) for Maths! He was also awarded Edusave Bursary Award in 2012. Shahfizan (S4), had never passed Maths. He is finally passing Mathematics after he joined EduFirst. He is aiming a B for his N' levels now. He was also awarded the Edusave Bursary in 2012. 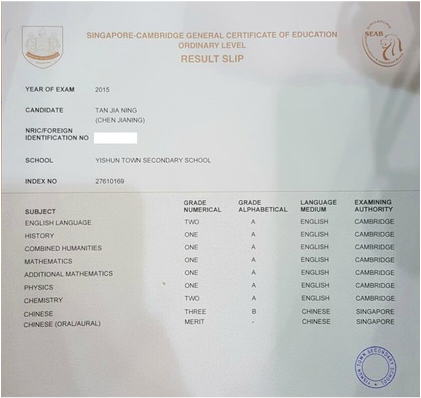 Goh Dai Ying (s4NA), who has been scoring around B's for Chinese, has obtained A1 in her 'O' Level Chinese examination! Daffaa (S2E), he came for tuition with F9 in science. In 2 month's time, he made such a huge progress and scored B3!